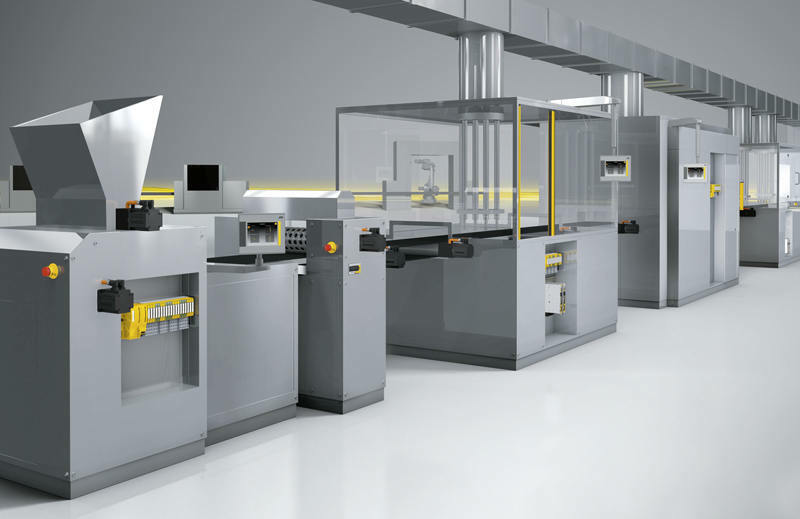 With the automation system PSS 4000 you can implement various projects – from stand-alone applications through to networked plant and machinery. Whether for small machines or interlinked, highly complex plants. The automation system's control systems PSSuniversal can be used decentrally in accordance with the multi-master principle and can be configured via a single software tool. It doesn't matter whether your system uses 12, 34 or more control systems from the automation system PSS 4000. As the first distributable control systems for safety and automation, the control systems PSSuniversal make the automation system Industrie 4.0-compatible. With the software platform PAS4000 you can have a central overview of your distributed user program at any time. In PAS4000 you can configure, program and diagnose all the control systems in the network. This enables simple, standardised handling across the whole project. This in turn delivers clear reductions in the costs of engineering, commissioning and maintenance. Process or control data, failsafe data and diagnostic information are exchanged and synchronised between the various automation components via Ethernet. All the information is known and accessible equally to all network subscribers. The communication connections of all control devices, between individual modules for example, as well as variables and process data, are known to the whole project and are created independently by the tool in accordance with the program distribution. This way it is very simple to implement even complex projects with the automation system PSS 4000. Distribution of control intelligences: where multiple control systems need to networked, this can be implemented simply via a software tool. Reduced engineering and shorter project runtimes: you can start programming without having to select your PLC and control architecture first. This can even be selected during the construction phase. Machine is easy to expand: the user program can be distributed to other control systems without any great effort. Subsequent adjustments to the system and changes to individual plant sections are easy to make. Increased productivity: partial commissioning and partial operation of individual machine parts possible. Visit us at SPS IPC Drives in Germany (Nuremberg) in Hall 9, Stand 370. We would be happy to provide a detailed introduction of the automation system PSS 4000. PSS 4000: the Industrie 4.0-compatible automation system!